The Vietnamese Lasallian Youth Troupe (VLYT) is a voluntary, youth-based, performing arts organization that specializes in Vietnamese drumming and dancing. The troupe takes its name from the De La Salle Christian Brothers who are dedicated to educating the youth in the spirit of faith, charity and fellowship. The troupe was established by a fellow Lasallian, Brother An Phong Tran, F.S.C., over 35 years ago in Philadelphia, PA. When Brother Phong relocated to California in 1990, he soon after established a group in San Jose, CA. The first theatrical production took place during the Lunar New Year (Tết) of 1991. 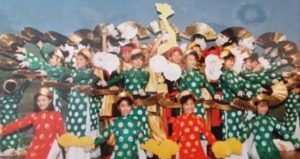 During the 1990s, the troupe’s purpose was to offer a place where Vietnamese-American youth interact with one another and share their Vietnamese heritage. At the time, the troupe produced simple skits and dances. As VLYT evolved through the years, the troupe created elaborate shows influenced by faith-based narratives and the history of Việt Nam. 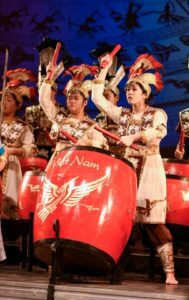 As the troupe entered the new millennium with the rest of the world, they began to introduce Vietnamese drumming with compositions influenced by traditional procession drumming as well as modern-day rhythms. Over the years, the troupe has steadily expanded its activities outside of its San Jose-based community. Aside from performing for their local Vietnamese and Catholic community, they were invited to perform in venues all over the world. From performing at faith based events in Southern California, Missouri and Texas to international events such as World Youth Days in Canada, Germany, and Australia, VLYT remains humble in its mission to share its faith and heritage through performing arts.